We are often asked the question, “what is a central vacuum?” Many people have heard this term before but don’t really know what they are or the benefits of owning a central vacuum system. One of the greatest things about a central vacuum system is that you can stop carrying a heavy systems from room to room. A central vacuum system is designed to move dirt and debris from the house and send through tubes in the wall to a canister in your garage (or location of your choice). You can place hose inlets around your house at convenient spots and simple move the lightweight hose/vacuum and plug it in from room to room. As the canister is placed outside of your home, the noise from your central vacuum system is very minimal. 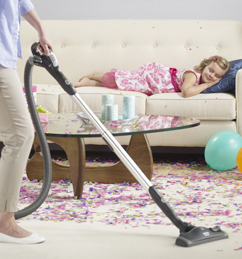 Central vacuums are easy to use and very versatile coming with many available accessories to properly clean every inch of your home. The motors are up to 5 times more powerful than a regular vacuum allowing more dirt and dust to be cleaned up when vacuuming. Central vacuums are very portable but built to last for a long time. You will save money not having to replace common vacuums every few years. The central vacuum system are very durable and also add value to your home for future resale.